Like many of New Jersey's county seats, Bridgeton walks the thin line between historic and kind of rough around the edges. Some of the buildings downtown are well cared for and restored, while others just look old and a bit rickety, reminding me of what we saw during our visit to Mount Holly. There's a lot of potential in the Cumberland County city, maybe just not enough funding or consistent momentum to follow through quite yet. 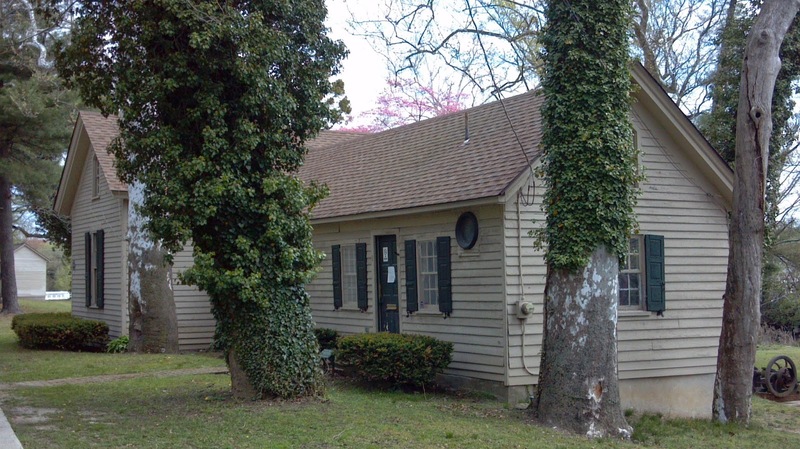 To their credit, interested Bridgetonians worked to have portions of the city placed on the National Register of Historic Places, creating the state's largest historic district. More than 2000 buildings stand within the district's boundaries, with notable samples of Colonial, Federalist and Victorian architecture among them. Though they don't have the attention-grabbing quality of having been homes or workplaces of famous Americans, they're remarkable in that they represent the history of an early southern New Jersey industrial town. And with so much history having been torn down in other places in the name of progress, it's remarkable to be able to visit a place where so many older structures remain without being substantially updated, at least on the outside. After my stop at the Garton Road Shul, I decided to make a pass through Bridgeton and explore whatever caught my eye first. That turned out to be City Park, a 1100-acre tract running along the historic Cohansey River. Though, like the rest of town, it appears to have seen better days, it's a nice spread, with pleasant walking trails, basketball courts, fishing lakes and the Cohanzick Zoo, the state's first municipally-owned zoo. It just needs a bit of the TLC that it seems many municipal budgets can't accommodate these days. Just beyond the old-fashioned welcome sign on Mayor Aitkin Drive, I came upon an tan clapboard building that looked as if it might be an old park office or clubhouse. A marker notes that the property was the site of the Cumberland Nail and Iron Works, once one of the city's largest employers. The building was the company's office and the last structure remaining from the business. The glass industry was a dominant force in 19th century Cumberland County, but foundries and other iron-producing ventures found a home in the region, too. Following the establishment of a similar venture in Millville, David and Benjamin Reeves founded the Nail and Iron Works along the shores of the Cohansey in 1815, capitalizing on power from a nearby dam and the availability of Pinelands bog iron. Over the years and through several changes in ownership, the business grew to line both banks of the river, with nail cutting machinery on one side and a rolling apparatus on the other. In the late 1800s, the foundry employed up to 400 men, with an annual production of 40,000 kegs of nails and 4 million feet of piping. A 1902 directory of iron and steel works says the Cumberland Nail and Iron Works was operating 14 coal and oil-fired furnaces, along with 90 nail machines with an output of 140,000 kegs. By then, its pipeworks had been sold to another company for the production of gas tubing. It's a challenge to imagine how the site looked when the operation was in full swing, but it must have had some attraction to non-employees, as Bridgeton residents often came onto the Nail and Iron Works property for recreation on the river and the rolling hills above. Ultimately, the city purchased the land and the office building in the 1901-1902 timeframe for use as a public park. What ultimately happened to the company, it's hard to determine. Was it sold and moved to another location? Did it go out of business? I got no answers from the old building. Tourist guides for the area will describe it as the Nail Mill Museum, reported to hold fascinating artifacts ranging from nails manufactured on site and samples of Bridgeton glass to a model railroad setup. Unfortunately I couldn't check it out because it's been closed for the past few years, with a 2011 county notice to vacate the property still tacked to the front door. 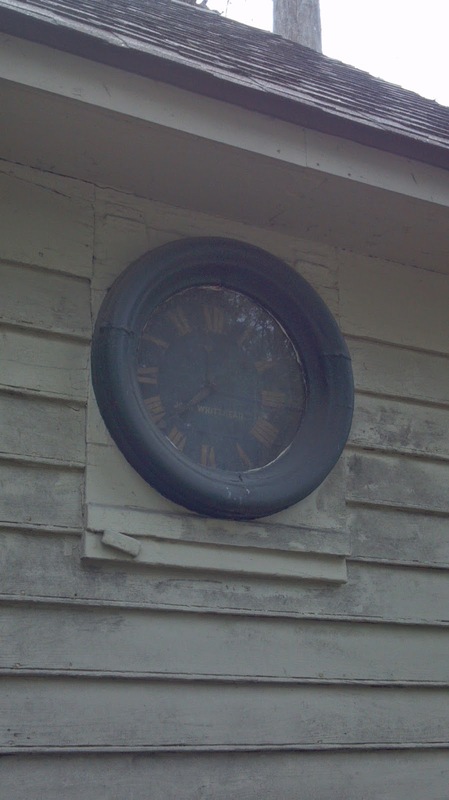 The building may not be accepting visitors, but one of its relics remain fully visible to passers by: what's said to be South Jersey's oldest public clock. Installed in 1830, the large timepiece is embedded in the front wall of the building. It has dials both inside and outside so that company management could see it as easily as the employees hustling past to get to work before starting time. And its two faces reportedly bear the names of two different men: John Whitehead and J.C. Harris, though the Haddonfield-based Whitehead is generally acknowledged as the craftsman who built the clock. As the story goes, Harris, a Bridgeton clock repairman affixed his own name to the inner clock face when he fixed the timepiece. My sources tell me that the clock is a longcase or grandfather-style, meaning that somewhere within the works, a pendulum helps it keep accurate time. It may have just been a coincidence, but when I was there, it was showing the correct time, taking away the extra hour we leaped forward for daylight saving in March. Even though workers are no longer checking their arrival and supervisors aren't docking for a late arrival, it seems that the spirits of Whitehead and Harris may just be keeping that timepiece running accurately. Thanks for visiting Bridgeton, Down Jersey-way! There are plenty of little, hidden and slightly forgotten places in Cumberland County!